Described as upright and dwarf, Berberis thunbergii ‘Pow Wow’ could also be described as having brilliant autumn colour. This is an upright variety which has a foliage pallet like no other. New foliage is a golden yellow, it turns to a chartreuse flecked with cream in summer, and as autumn comes around it puts on its final display. 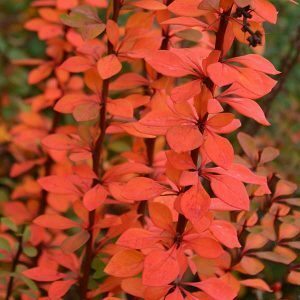 Wonderful long lasting orange to red foliage on dark red stems that both the ‘Wow’ and the ‘Pow’ factors. We also like it for the strongly upright growth which makes it suited to narrow spaces. Plant it along a driveway, use it as a feature in the garden border where it helps add height and structure. Or use it a low hedging plant along a fence line or as a dividing hedge in the garden. Prepare soil well before planting, ensure drainage is good and add extra organic matter if needed. Prepare a large planting hole, twice with diameter of the pot. Water the plant a few hours before it from removing from the pot. Water in with a liquid seaweed fertiliser. Mulch well and water through the first summer. Height – Will reach 1 – 1.5 metres in height. Spread – Upright to .4 metre. Flowers – Small yellow flowers followed by red berries. Spacing – Plant at between 40 cm and 90 cm apart depending on desired effect.